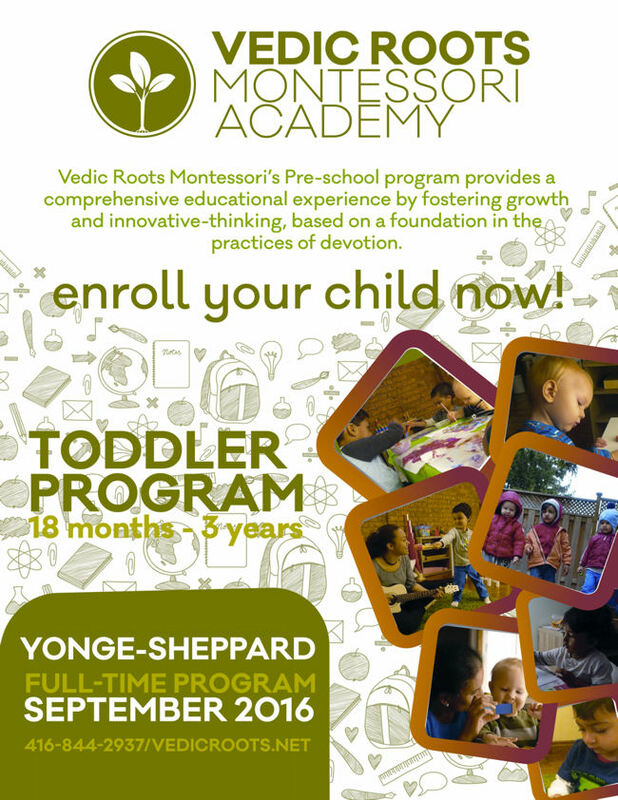 Vedic Roots Montessori Academy ~ The Toronto Hare Krishna Temple! 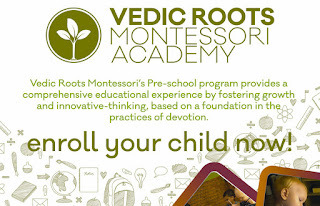 The Vedic Roots Montessori Academy (VRMA) is now open in Toronto! Can you imagine a school where children are looked after academically, socially, cognitively, and spiritually? A school where the children learn reading, writing, arithmetic, and also wholesome Vedic values? Opened in September of 2015, the Vedic Roots Montessori Academy aims to achieve this holistic vision. The Montessori method of education ensures that children develop the fullness of their individual human potential through independence, inner discipline, and discovery. The objective is to provide children with the structure, groundwork, knowledge and social skills to successfully move into the future. With the addition of a Vedic education, our students are sure to grow into healthy, happy, spiritually grounded adults. This spiritual soundness, in particular, can arm our children with the strength to resist peer pressure, and to cope with the stresses most students typically encounter.